In many cases, when a homeowner would like to replace their kitchen countertop they would like to choose a countertop that matches the existing décor of the kitchen. Because granite countertops often have several different shades or colors present in a single slab of the stone, it may be difficult for homeowners to know what color of granite countertop would look the best in their home. There are some things that the homeowner should keep in mind when choosing a granite countertop to complement the existing décor of a kitchen area and adhering to these tips can help the homeowner find a granite countertop that works perfectly in their home. 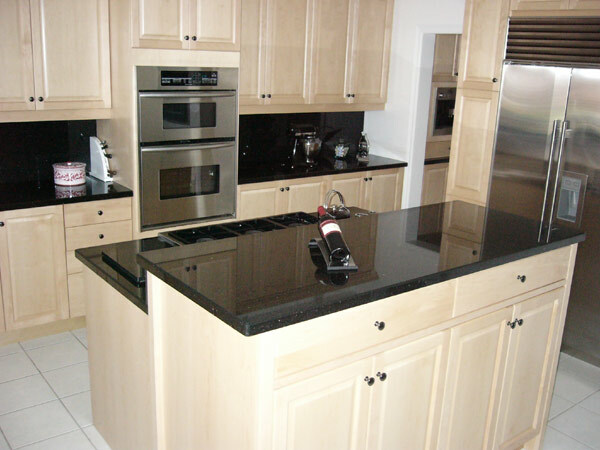 For homeowners that have a dramatic color scheme present in their kitchen area, the best choices for a granite countertop will be a black or dark grey countertop. Using these dark colors for the color of the countertop will create a significant contrast between whatever colors are used for the walls and the cabinets and the countertop. It does not matter whether the colors that were used to paint the walls are white, brightly colored, or dark as the shade of the countertop will complement all three color schemes. Many homeowners choose neutral colors for their kitchen area so that the colors will complement the wooden cabinetry used in the kitchen. If the kitchen area is mostly neutral shades of white, eggshell, beige, or tan, then the most complementary granite countertop colors to place in these areas are colors that have a brown tone to them. Often, these brown toned countertops come in a number of different shades and the colors contained in the countertop may range from dark brown to off-white. A good rule of thumb is to choose a countertop shade that is one or two shades darker or lighter than the color of the cabinets in the kitchen area. Homeowners that would like to add some color to their kitchen area can choose from different shades of pink, green, or blue granite countertops. These colors are often more difficult to find as many manufacturers do not regularly create these color countertops, but with the ease of shopping on the internet, a homeowner should be able to find a manufacturer in their area that will be able to install or supply the color of granite countertop that they desire. Pink hued granite countertops are the most popular type of these countertop colors because they can complement a wide range of wall and cabinetry colors. Each of these different colors of granite countertops come in a wide range of colors and hues, so it is very important to compare different countertops carefully when choosing a countertop for your home. A small sample of the countertop material may not provide the homeowner with a good example of what the entire countertop in that shade and pattern will look like when added to the home. The best way to compare different granite countertop colors and shades is to actually view the entire countertop in a showroom or obtain images on the internet of the entire countertop placed in the kitchen area of a home.